Ease administration with Enterprise Configuration Manager. At first glance, I had a hard time finding things I liked about Configuresoft’s Enterprise Configuration Manager (ECM) 4.0. It struck me as yet another inventory tool in an industry overflowing with competing products. I later came to realize that the greatest problem I had with ECM was my perspective. Once I reached my Eureka! moment, I discovered that this product fills a specific hole missed by similar products and simplifies processes that require advanced skills to achieve with other inventory tools. During installation, I noted that the suggested database size is 25MB per client! You can split the installation between up to three machines (ECM, SQL and IIS) but you’ll need to contact Configuresoft for guidance. 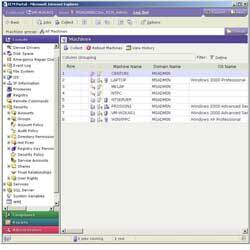 ECM 4.0 is a tool for managing Windows machines newer than Win9X. Administrators wanting to manage 9x or Unix/Linux operating systems need not apply. The bulk of ECM implementations are for managing servers but, as the number of Microsoft OS-based enterprises grows, more companies are also using the product to manage workstations. One nice feature is its simplified ability to collect an Emergency Recovery Disk (ERD) from managed machines. This is also a significant contributor to the database size, so reducing the number of ERDs collected, as well as aging them quicker, will help control the database size. The Compliance feature is a big selling point for enterprises looking to manage the desktop image. Not only can you manually define the standard, but you can point ECM to your reference machine and tell it to create a compliance template from that computer’s settings automatically (you choose which settings to consider). The best part is that you can also tell it to update the compliance template dynamically as the reference machine changes. ECM 4.0 is managed entirely through a Web interface. While that isn’t at all original, I really like that the console can be configured to display data adjusted to your local time zone. The user roles and permissions are extremely granular. Still, I have a problem with the fact that everything is configured for individual users, and you can’t assign permissions to a Global Group. Currently, the product is a standalone, but Configuresoft is developing an add-in module that will allow multiple installations to be configured in a hierarchy. 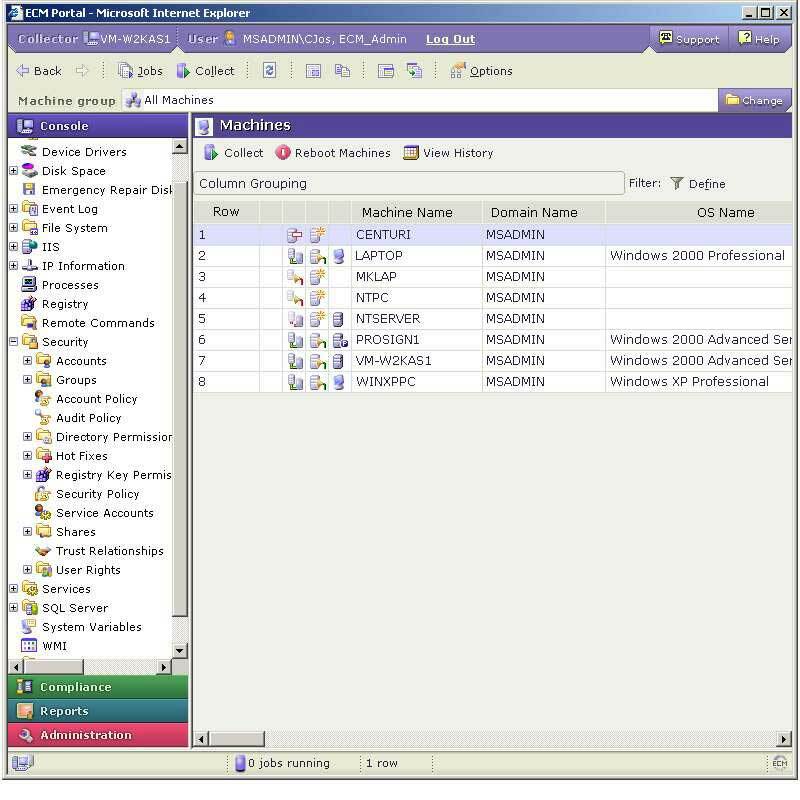 Enterprise Configuration Manager is a product that Configuresoft originally purchased from Serverware (www.serverware.com). In earlier iterations, Configuresoft merely modified the purchased product, but this 4.0 version represents a complete rewrite of the product. So even if you’ve considered this program before, you may want to have another look. Joe Crawford, MCSE, works as a support engineer for HP, supporting Microsoft networking technologies. He specializes in Microsoft Systems Management Server and scripting.